Joining Gwendoline Christie is Academy Award winner Lupita Nyong'o of 12 Years a Slave. Two fantastic actresses were just officially added to the cast of Star Wars: Episode VII to make the cast slightly less heavy on male characters. 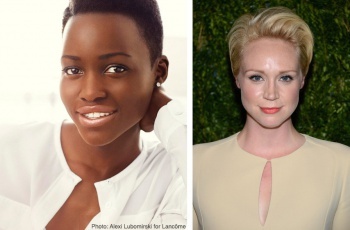 Lupita Nyong'o and Gwendoline Christie will play unnamed roles in the next Star Wars film, directed by J.J. Abrams. Gwendoline Christie plays the honorable Brienne of Tarth in Game of Thrones. Christie will also be in next year's The Hunger Games: Mockingjay - Part 2 as Lyme. Lupita Nyong'o earned her Academy Award for Best Supporting Actress in 12 Years a Slave as Patsey, her breakout role, making her the first Kenyan to win an Oscar. "I could not be more excited about Lupita and Gwendoline joining the cast of Star Wars Episode VII," Lucasfilm president Kathleen Kennedy said. "It's thrilling to see this extraordinarily talented ensemble taking shape." Some of the primary criticism for Star Wars Episode VII came from the lack of women in the movie. With Nyong'o and Christie joining the cast, the total of women playing characters in the new Star Wars is four. That's still only four to the men's 11, but it's progress. Other cast members include John Boyega, Daisy Ridley, Adam Driver, Oscar Isaac, Andy Serkis, Domhnall Gleeson, Max von Sydow, Harrison Ford, Carrie Fisher, Mark Hamill, Anthony Daniels, Peter Mayhew, and Kenny Baker. Star Wars Episode VII opens Dec. 18, 2015.